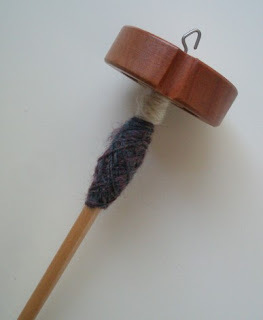 It's true, I've been knitting a lot lately, but I haven't completely neglected actual spinning on the spindle. In fact, the other day I plied my first yarn! The darker stuff is mine - the white stuff is the sample made by the extremely nice woman who sold me the spindle. I keep it there to remind me how spun yarn is supposed to look. I have a long way to go. 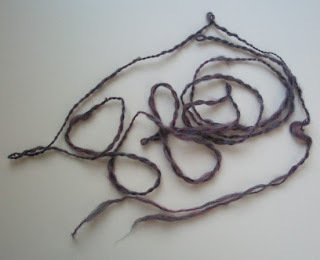 Still, I do wind yarn nicely on the spindle, don't you think? That looks much nicer than my first yarns- mine were horribly lumpy and bumpy and overspun. Yours is beautiful! You are so nice to say so! I was just happy it made such a nice fish. I did actually knit it into a square post-aquatic-adventuring... must take a pic of that. It was very squishy and nice, if totally uneven and underspun. I won't tell you what I saw, because I'd like my comment to get past the censors.